Starstruck mask is from Gypsy Renaissance's Celestial Visions mask collection. 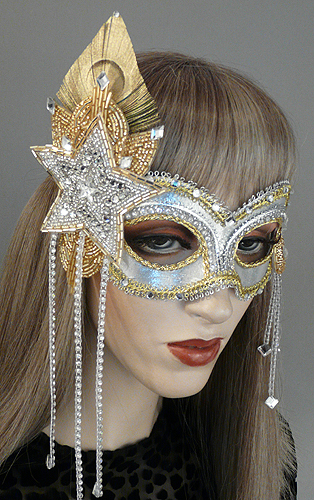 Starstruck is a handmade gold and silver masquerade mask with a star adornment. Starstruck mask is covered with silver tissue lamé and trimmed with metallic braiding and rhinestone banding. 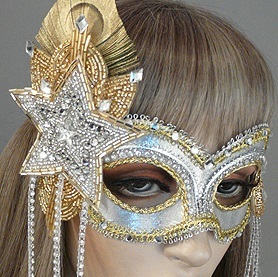 Mask is adorned with a silver and golden rhinestone and glass beaded star, rhinestone dangles, and a golden peacock feather.